Using PowerPoint to create Encoded Communication Displays. 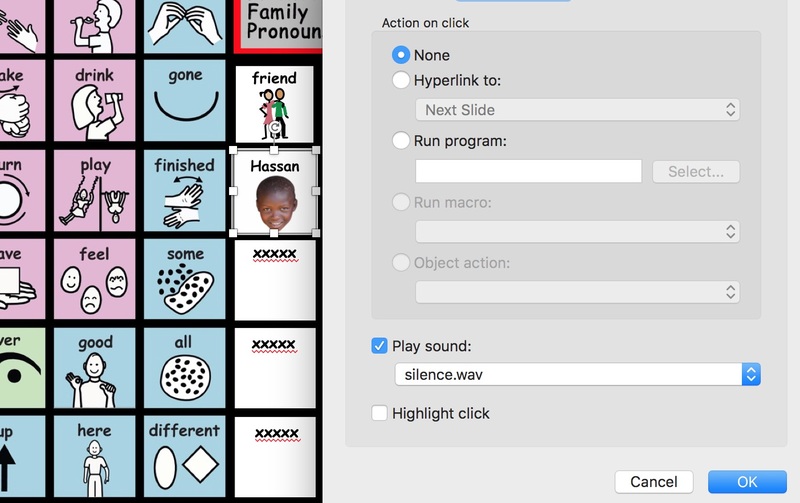 Powerpoint lends itself beautifully to creating simple encoded communication displays … hopefully a nice addition to your roster of options supporting a Core + Fringe agenda in the classroom. Once created these encoded displays can be displayed on an iPad or graphics tablet using the free Microsoft PowerPoint app. An encoded format has the advantage of allowing a student with motor and/or visual challenges to access a larger array than would be possible using a single display that is not encoded. The display can be used independently, or in a facilitator-assisted format. 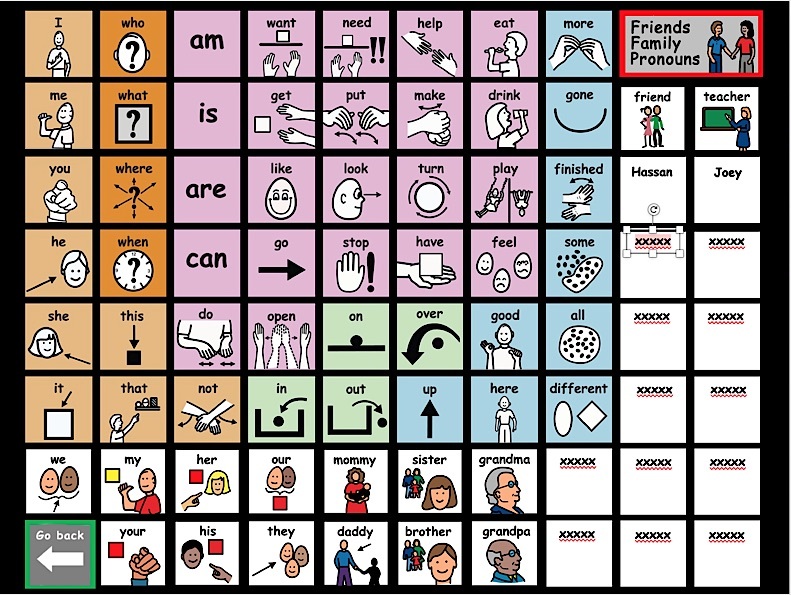 Regardless, a full array of core symbols is available to the Facilitator to provide crucial Aided Language Stimulation during classroom routines. Here are several formats that might be a good fit for that previously 'hard to fit' student. Please note these formats can be easily replicated in most commercially-available communication page sets, e.g. Proloquo2Go, Compass etc. The steps provided in this blog post are specific to PowerPoint. e.g., 12 sections of 4 symbols. Create a home/master slide with core symbols arranged in distinct sections (e.g., 4 symbols per section; 9 symbols per section). Color code the symbols according to student/agency need. Depending upon student need, you may also consider making each section more distinct by color coding the section. For example you can ring each section in a different color or present each section on a distinct colored background (not depicted). Cautionary Note: use only enough visual 'bells and whistles' to improve functionality …without making the display too visually distracting. After you have laid out the sections on the slide, each section must be saved as a single image to which a single 'go to' action will be assigned. Select all the components for a given section … right click… select Save as Picture to your desktop. Import/'drag and drop' these composite images back on to the slide and substitute these single images for their more complex counterparts. 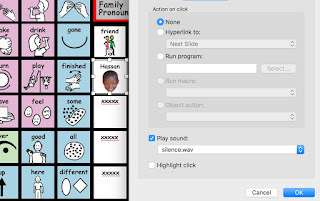 Space permitting, you can present additional buttons along the side or bottom to access frequently-used fringe symbols that may support your academic agenda, e.g., colors, numbers, shapes, photos of fellow classmates, classroom activities, favorite toys/youtube videos. As these additional buttons are smaller they might be used in a Facilitator-assisted format, i.e., the Facilitator triggers the button when there is a need to choose a color or select a friend during a Get Up and Dance Circle Time routine. The student then independently accesses the desired color or photo face on the 'enlarged slide'. Link each section (each a single image) to its own unique PowerPoint slide where the symbols of that section will be presented enlarged. Enlarged symbols are easier to see and ideally easier to activate. 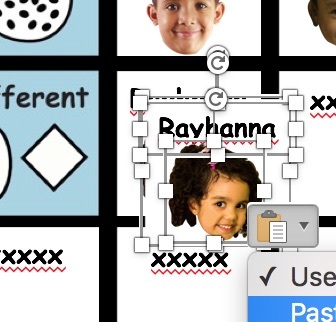 Arrange these symbol images in a way that minimizes accidental activations for that student. For example, you might spread the symbols equally on the page or position the 4 symbols in the corners of the page … or you might leave additional space between symbols to minimize accidental activations. Again you need to present each symbol on this page as an individual picture so you can assign voice-output to that single unit. The symbols must be arranged on an 'inert' background, i.e., a rectangle (filling the page) to which the sound 'silence' has been assigned. That is, if a non-symbol area is accidentally activated it will trigger an imperceptible moment of silence rather than advancing the document to the next page. Include a 'return button' on the 'enlarged page' that allows you/student to return to the home/master page. 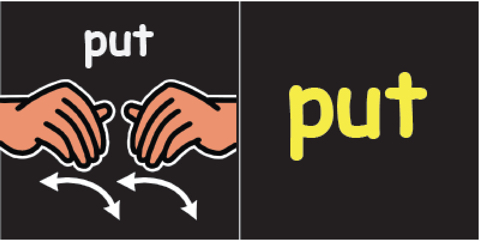 Again depending upon student needs this button can be easily accessible or Facilitator assisted. Create the button using the shape tool… right click on the newly created shape … select Action Settings … select Hyperlink to … Slide 1 (where your master page resides). Be sure to add a subtle click sound (Play sound) to provide feedback (Yes! the button has been successfully activated). Hope this information proves helpful to your practice. The PowerPoint pen tool can be used to mark up any text provided in an Animated Step-by-Step resource, allowing a skillful teacher to highlight key literacy components as she reads the text. 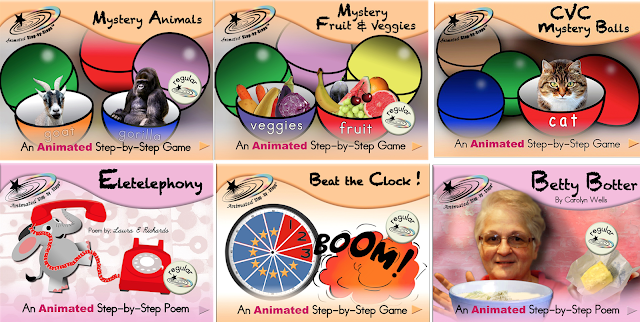 The pen tool is especially helpful when using Animated Step-by-Step Literacy Resources that have 'fill in the blank' literacy components (e.g., Mystery Animals, Mystery Fruit &Vegetables, CVC Mystery Balls, Beat the Clock, Eletelephony, Betty Botter and the 'alternate versions' of various poems such as Miss Polly's Dolly). Check out the Big Literacy Bundle on Teachers Pay Teachers. Obviously if you are displaying your ASbyS on an interactive whiteboard you would be using the pen tools of that platform, e.g., Smart Notebook, Activinspire. 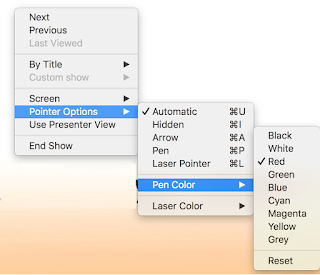 When your PowerPoint resource is in slide show mode, you can use the regular cursor to activate the page animations. When you need to write on the page, enter command p on your keyboard and the pen tool will be substituted for the arrow cursor. 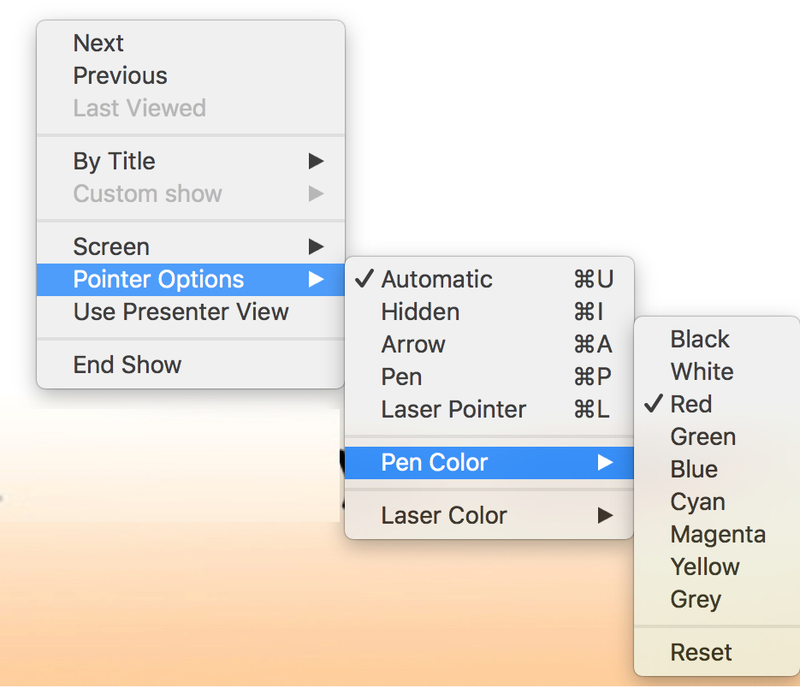 To exit the pen tool while in slide show mode, select the escape button (esc = upper left corner of keyboard on a mac). 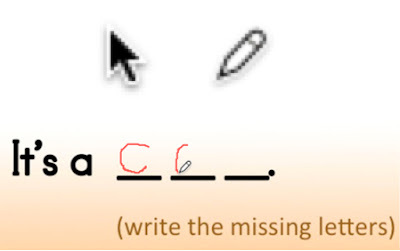 The pen cursor reverts to an arrow cursor. I recently used the pen tool while playing Mystery Animals with three, typically developing girls (ages 3, 5 and 8). The youngest (Aubry) participated by announcing the color of the ball that rolled on the page .... the 5 year old (Isla) and the 8 year old (Eve) used the animal sound effects and the numbers of blanks provided for the mystery animal's name to help them problem solve the identity of the mystery animal. Once the ball opened and the mystery animal was revealed, the girls proceeded to sound out its name and fill in the letters. I was in charge of using the pen tool to document the letters. Eventually Eve took the helm to write in the letters. I was heartened by the fact that everyone was engaged and that pen tool really helped to make the resource even more engaging. Many early childhood classrooms are using a Core + Fringe format during their classroom routines (Circle Time, Story Time, Arts & Crafts, Science etc.) In so doing they are ensuring that their Aided Language Stimulation is providing students with a fuller range of communicative functions ... not just focusing on 'wants and needs'. I've just posted (Teachers Pay Teachers), several sets of Dual=Representation Core Symbols. 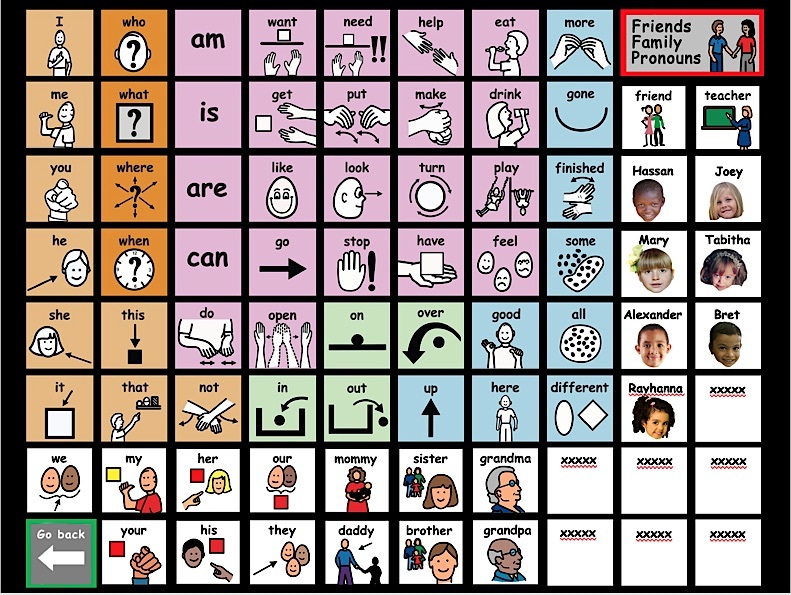 These PCS symbol sets (four versions reflecting different color coding systems) are intended for use on a classroom Facilitator/Modeling Board and would be supplemented with activity-specific fringe symbols (not included). During the mealtime breakfast/lunch routine, a Facilitator uses the modeling board to conduct Aided Language Stimulation(ALgS) as she oversees the group mealtime routine. Added fringe symbols might include eating tools (BOWL, SPOON, KNIFE, CUP, PLACEMAT, PLATE, NAPKIN), menu-specific food items (WATER, APPLE JUICE, CEREAL, MILK, BANANA) additional verbs (POUR, CUT, SPILL/UH OH) and additional adjectives/adverbs (CAREFUL, HUNGRY, THIRSTY). During the lunch routine, the fringe vocabulary might reflect the CHICKEN, PEAS & CARROTS, and FRUIT CUP on the menu that day. During Arts & Crafts the fringe vocabulary would reflect the BAGGIE, PIPE CLEANER, SEQUINS, RIBBON, WINGS, BODY, ANTENNAE needed to make that BAGGIE BUTTERFLY art project. The Core Symbols in these resources are constructed as Dual=Representation Symbols, i.e. 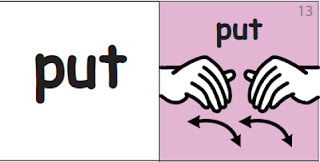 one side of the symbol might display the picture symbol, the flip side might reflect the enlarged printed word to provide a greater literacy agenda. D=R symbols have the distinct advantage of allowing you to straddle two levels/types of representation when conducting your lesson. This is especially helpful if you are dealing with a 'mixed ability' classroom, i.e., a classroom in which student abilities span a challenging broad range. Fringe symbols often reflect three formats: Picture Symbol=Printed Word or Picture Symbol=Photo or Picture Symbol=HC symbol. 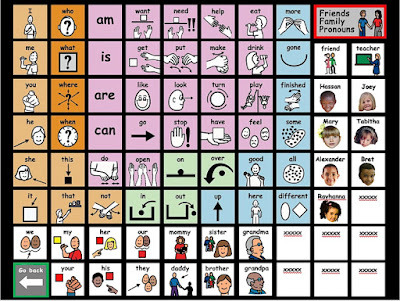 In some classrooms there might not be a need for detachable Dual=Representation Symbols, so the core symbols on the base display are laminated permanently to the base board or alternately they have been constructed as a Staples Banner. You could also use the Staples Banner concept to create a text-based base for your detachable symbols. 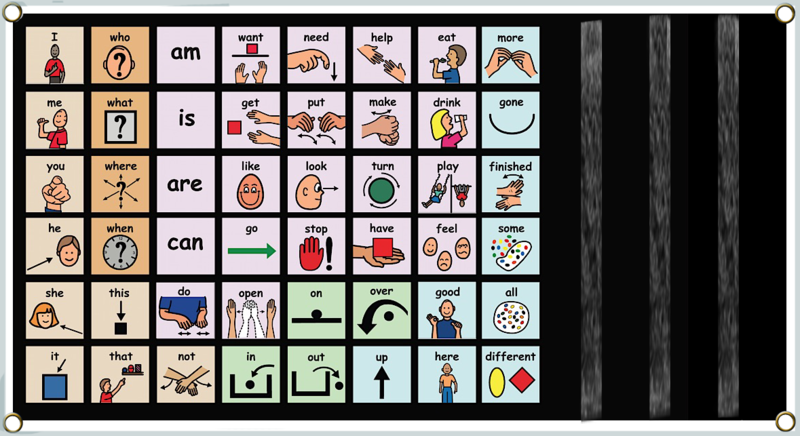 Aided Language Stimulation (ALgS) is conducted by pointing to these core symbols (either permanent or detachable) on the base display (using the Facilitator Board zone) and added detachable fringe symbols on the far right of that banner. 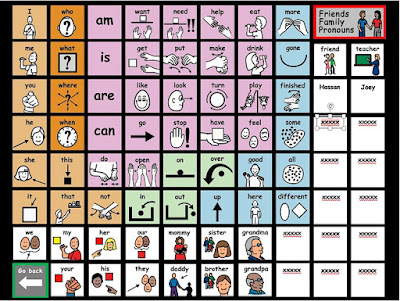 Aided Language Stimulation, however, can be conducted across four zones (Facilitator Board Zone, Facilitator Vest Zone, Hand Held Zone and Student Expressive Zone). A Facilitator differentially 'weights' these four zones, based on the developmental level(s) of students in the class. If your students are 'cognitively young' with emerging joint attention skills, you might opt to primarily use the 'hand held zone' as it allows you to place the symbol in the child's visual field. The Facilitator Board is now being used as an option for organizing the symbols for quick pull off. Eventually the Vest Display Zone might be added to accommodate two- or three- symbol phrases. 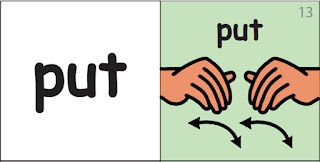 In some classrooms I am using the picture symbol, backed with its corresponding printed word. 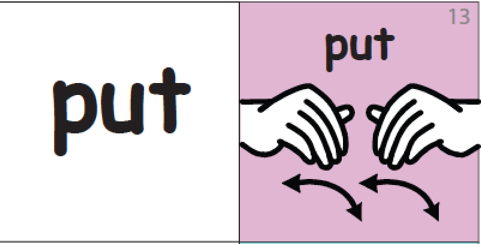 Sometimes I'm showing the printed word side first to allow students to puzzle over the word … the card is then flipped to confirm whether they were correct. In other classrooms, I am primarily using the picture symbols side, but I periodically flip to the printed word side to provide some literacy stimulation during the activity ('literacy flip'). 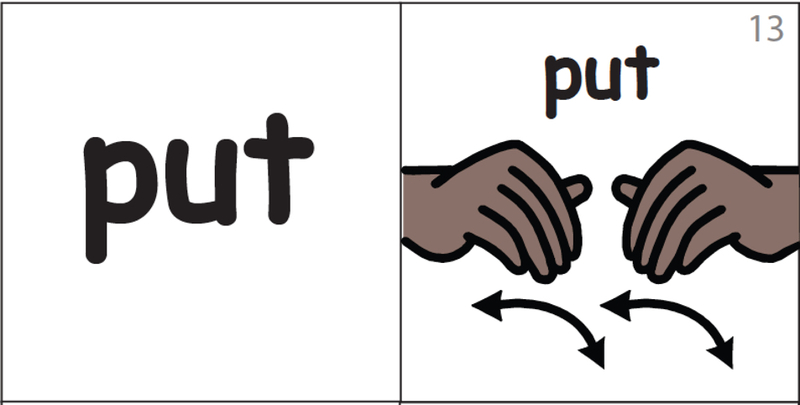 If I have a child with a significant visual impairment … a child who might benefit from high contrast symbols … I might opt to use the regular symbols (for the benefit of the group) backed with High Contrast symbols (for the benefit of the child with VI). This allows me to periodically show the high contrast symbol (hand held) 'up close and personal' in the child's preferred visual field or to create a small phrase on a velcro receptive black board. There certainly is a variety of color coding systems out there … and that is the reason there are 4 versions offered on Teachers Pay Teachers. Version 4: No color code. High contrast– color figures on a black background have been included with all 4 versions. Choose the system that works best for your students and your agency. I prefer to color code the core (rather than leaving it uncolored) as I feel the color coding helps me conduct ALgS across a field of 48 symbols. I often don't color code the fringe which does help to make a nice distinction between what is the 'unchanging core' and what is the 'changing fringe'. I do prefer to color code the background of the card (rather than 'ringing' the symbol with color). The former makes Aided Language Stimulation easier, while the latter makes the display feel more visually busy (obviously, my bias). 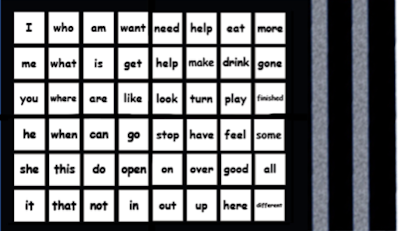 Yes, yes, yes, I know .... the grammatical category of a word can vary with context (perhaps the case for not color coding), but I find the primary purpose of the color coding is to help navigate the grid more efficiently when conducting Aided Language Stimulation. As your core symbols should be 'built to last', print these pdf files on heavy weight paper or alternately print on regular weight paper and use heavier laminate. Don't forget to leave a 1/8" border of laminate around the symbol to protect the symbol against fluids and splitting. Commodity Code Rollers (AM Industries of GA, Inc.) are used in grocery check-out lanes by cashiers and customers using self checkout. They are 4" in diameter and come in various lengths, i.e., 12", 14", 16", 18". I recall seeing a similar low tech option being used in the 'early days' of AAC (the 1970s ... yes it is hard to believe)…. and yes that was long before the advent of all the wonderful technology currently available to families. 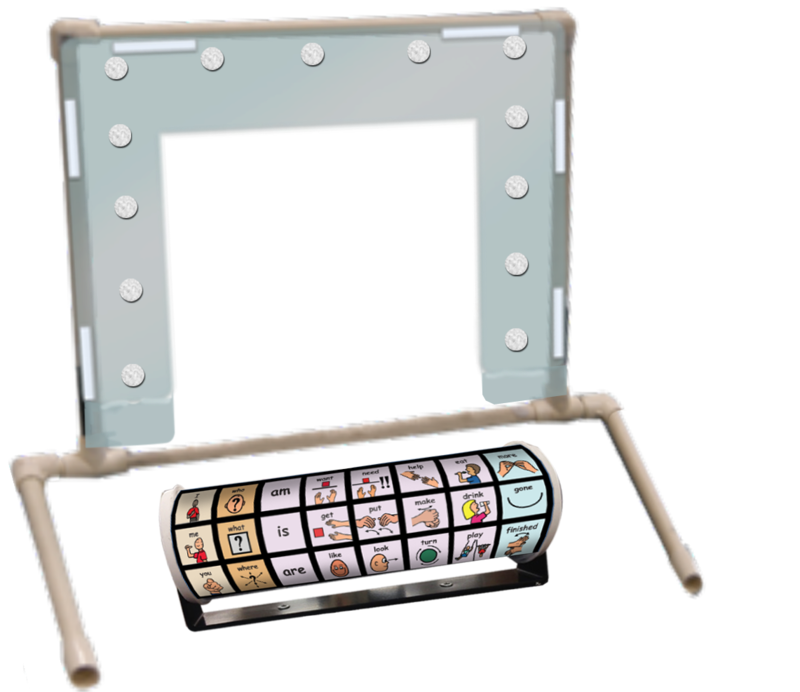 The Commodity Code Roller is intriquing as it holds potential for allowing students to use more limited space to access a larger vocabulary array … just spin to the symbol(s) you wish to communicate. The layout is limited only by your imagination. Need larger symbols ... no problem. Need more space between rows ... can do. 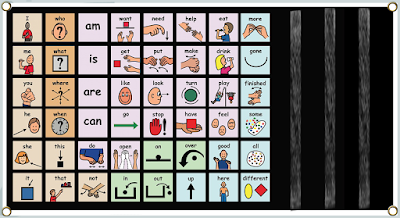 When conducting Aided Language Stimulation the communication partner rolls the display to symbols as needed. By way of example, consider having 48 core words + photo faces of significant people on your roller communication display. 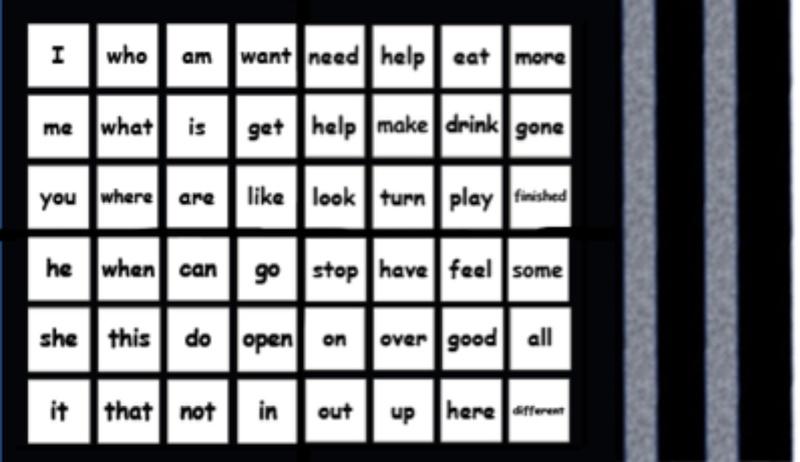 For some students, the communication array can be further expanded by adding fringe vocabulary on an eye gaze frame. A resource providing step-by-step instructions for Constructing an Eye- Gaze Frame using CPVC plastic pipe is available through Teachers Pay Teachers. Obviously the roller display option is not for everyone … but it may make a big difference for that one student for whom a good fit has been elusive. As I've mentioned many times before … in AAC it's all about accumulating a 'big bag of tricks'. 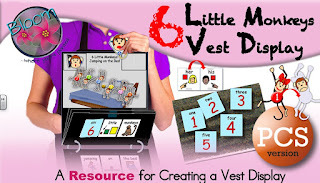 AM Industries of GA, Inc.
She is currently using the 6 Little Monkeys Vest Display as part of her Circle Time Routine. 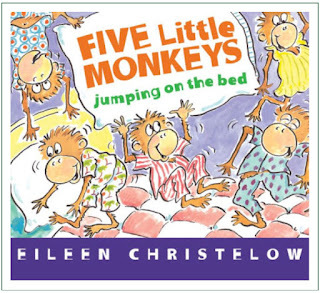 She then added the 5 Little Monkeys Jumping on the bed Book by Eileen Christelow during her Story Time. Chaya Sara also has access to two iPad versions of 6 Little Monkeys Jumping on the Bed that can be used for one-on-one intervention. The high contrast version is designed to address the needs of two students in her class with visual challenges. When I last visited her class. she had added a lovely extension activity for 6 Little Monkeys Jumping on the Bed. The six children in her class were seated legs tucked under the edge of a duvet filled with large pieces of foam (upholstery left overs). 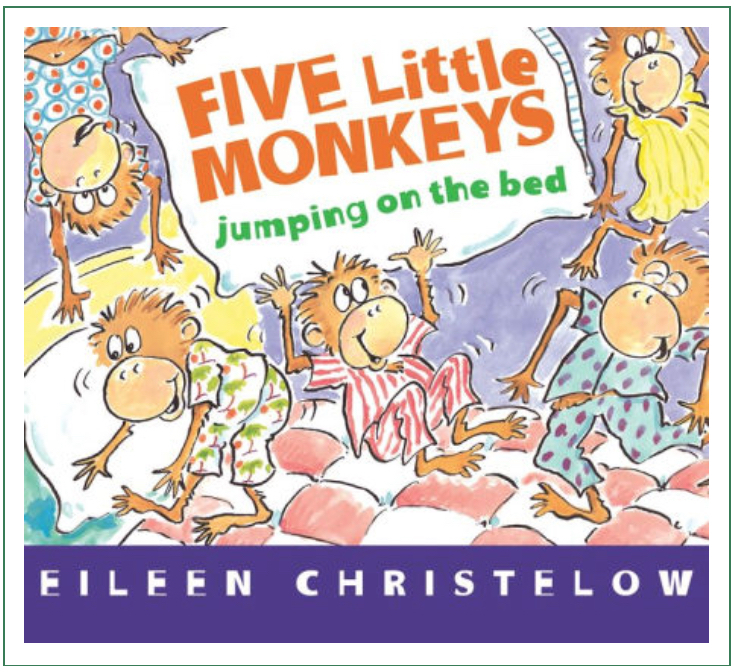 Chaya Sara had cleverly scanned and enlarged individual pictures of each monkey from the book (now 9" tall) and had attached them to a board covered with velcro-receptive, indoor-outdoor carpet ... allowing the monkeys to jump on the 'bed' as a unit. They can also be easily removed from the board when they 'fall and bump their heads'. 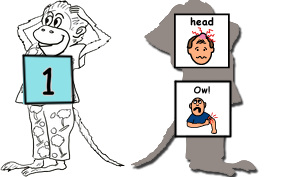 Chaya Sara's students have emerging joint attention skills so the symbols are presented ON the props, rather than on an additional communication board, e.g., each monkey has a number on its front and on its back are the symbols, (bumped) HEAD and OW! A simple voice output communication device with the message "No more monkeys jumping on the bed' can be velcroed to the flip side of the carpet board allowing the teacher to seamlessly offer the time-dependent repetitive line to be be activated by her students. This strategy of incorporating the symbols on the props helps to consolidate the visual focus ... especially important when children's joint attention skills are evolving. This activity also lends itself to replacing existing monkey faces with student photo faces. The chant now becomes 'Five little kiddies jumping on the bed' and engagement is further enhanced! A large sun graphic is attached to the front of a flashlight to support the lyrics 'out comes the sun'. 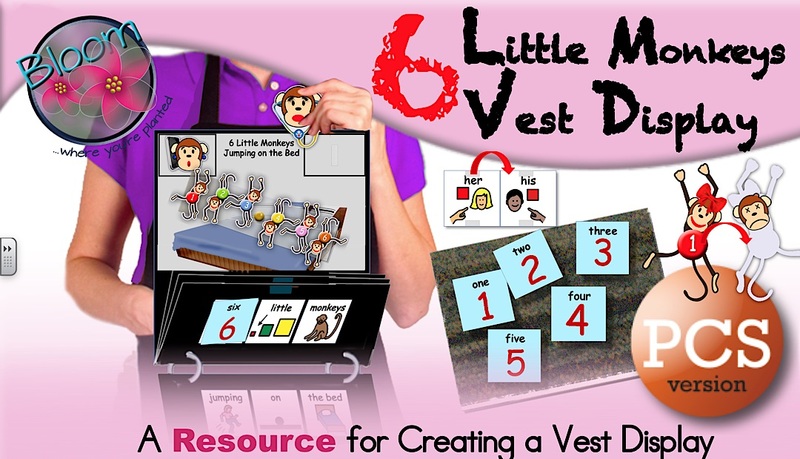 There are three vest display versions availabl (PCS, SymbolStix, VI) to support this curricular unit. The white duvet is now covered by a green sheet or blanket to simulate the green hills. The white duvet is now covered by a blue sheet or blanket to simulate the blue water. A gym bolster is added as 'the log'. A mister with warm water can be used to simulate the splash as each frog jumps into the water. 5 Fat Turkeys ... 6 Little Gingerbreads ... 5 Little Pumpkins You get the idea. In the hands of a skilled teacher .... content is repeated in a variety of interactive formats ... creating a rich learning environment that is both therapeutic and fun. 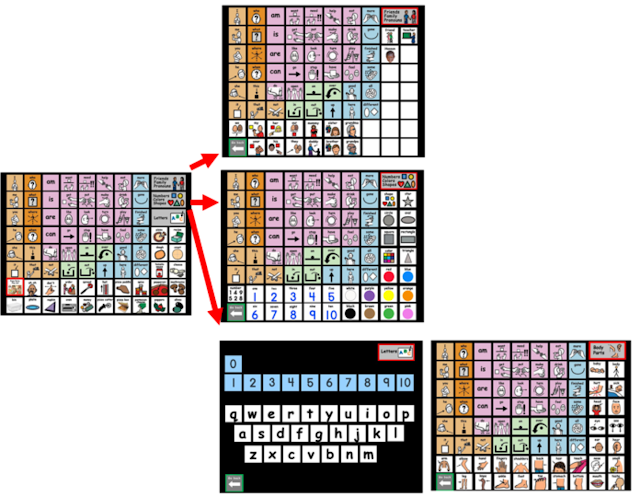 Initially, you may wish to make training easier for staff by offering fewer core symbols. You will NOT be eliminating these cells; instead, you will be altering the transparency of these cells causing them to appear as blank, black cells. Select the cell/picture that you wish to 'make disappear'. Under Format on the menu bar … select Format Object …select the Picture tab… select Picture Transparency …. move the transparency marker to 100% and presto the symbol magically disappears … the cell turns black. Repeat this procedure for all cells you wish to 'make disappear' temporarily. The audio is still attached to the cell. To 'silence' the cell … right click on the blackened cell … select Action Settings… Uncheck the Play Sound box. Now if you or the student accidentally activates a 'black cell', no sound will be produced. Eventually you will need to gradually re-introduce the full array of core symbols. This can be accomplished by adjusting the transparency slider back to 0% and re-checking the play sound box. The cell is still linked to the correct audio! Note: You can also easily achieve differentiated instruction by making hard copies of either full and reduced core displays. Print them out. Laminate them. Assign displays to the group members according to need. Aside: A more generic version of a digital Core-48 display (PCS, SymbolStix) is also available through TpT. This more basic version lends itself to quickly adding symbols harvested from Animated Step-by-Steps allowing you to provide symbol support for lessons involving Animated Step-by-Steps. A previous blog post (Using Core-48 Displays with ASbyS) provides detailed information for 'harvesting' symbols.